Tribes Overall: "Great introduction to life in and around Quito and then Galapagos! WOW! If only some of the parks in Africa took care of thier wildlife and environ the same way as Galapagos are..."
Tribes Service: "We gave Guy such short notice to find, arrange and book everything, it was amazing what he achieved! We had such a great Christmas and New Year because of him." 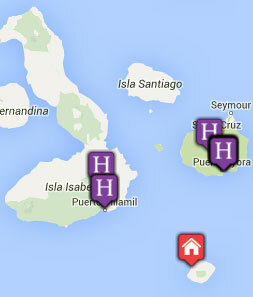 Guides: "Julio in Galapagos was excellent; knowledge, patient and very personable. We had several in Bellavista who were equally as good and great to spend time with discussing the wildlife, what they are trying to achieve and life in Ecuador itself." Social & Environmental Responsibility: "I have never been to a "park" which took so much care of their responsibilities and where everyone from the guide to the cook did the same. " Although not luxury, it was really great to see how they managed to provide everything you needed, with great food, and paths to follow. Staff were excellent throughout. Fairy-tail place! Warm fire burning a night meant it was hard to leave some of the public areas at night, but knowing that housekeping had turned on the heating and added hot-water bottles to the bed made easier to leave. Chatting to the owners over breakfast made you realise why they bought it too. A little bit of sanctuary from the crazy streets outside. Great location and we loved spending time there. "The first encounter with a turtle and penguin in the ocean was a magicial experience! However, I am continuously telling the story of nearly being "fished" by a blue-footed boobie while snorkling off Dragon Island, as it crashed into the sea less than a meter away trying to catch one of the fish from the shoal I was swimming among."